We have a special book giveaway for you today from Tor books. 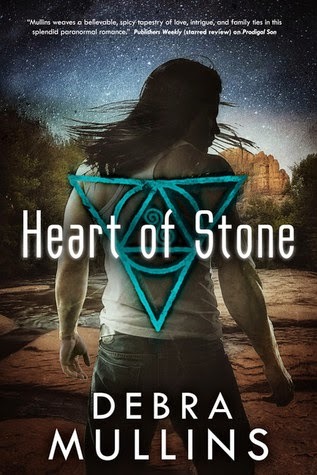 We are giving away a trade paperback copy of HEART OF STONE by Debra Mullins. Start the New Year with the new book in the Truth Seers paranormal romance series by Debra Mullins! Heart of Stone (Truth Seers #2) by Debra Mullins. Darius Montana is a Seer. With his gift of empathy, he can see into the hearts of others, both human and Atlantean. When his family comes into possession of one of the legendary power stones of Atlantis, Darius is sent to find the Stone Singer. Faith Karaluros is the last Stone Singer. Manipulated all her life for her rare ability, she is widowed after her husband tried to steal her power for the Mendukati, an extremist group that hunts Seers. Faith wants nothing more than to stay out of this war when Darius comes to find her—just in time to rescue her from being kidnapped. Faith goes with Darius, determined to do the job and be on her way with the money that can set her up where no one can find her again. She didn't count on the Mendukati sending a hit man after her. Darius swears he can protect her, but when she discovers he is one of the rare Atlanteans whose powers work on their own kind, can she trust him to keep his word, or is she being used again? We are giving away a trade paperback copy of Heart of Stone by Debra Mullins to one lucky winner! To enter, please leave a comment on this post and include your email address so we may contact you if you win. This giveaway is open to US and Canada. Giveaway ends December 31, 2014 midnight EST. I haven't read Derbra Mullins yet. This is probably a good place to start. I read this out of order, but enjoyed it. You can definitely start with Heart of Stone. Good luck! Cool cover and sounds like a good read! This one is on the wish list!! I'd love to win it. Thanks for the chance! This looks like a great book. The first one has been on my "to read" list for months so I'm excited to try it.